Bengalaru is travel-friendly and this is apparent with the introduction of web kiosk in airport buses. Now, travelers can make use of the time by checking their flight inside the bus using the web check-in kiosk. 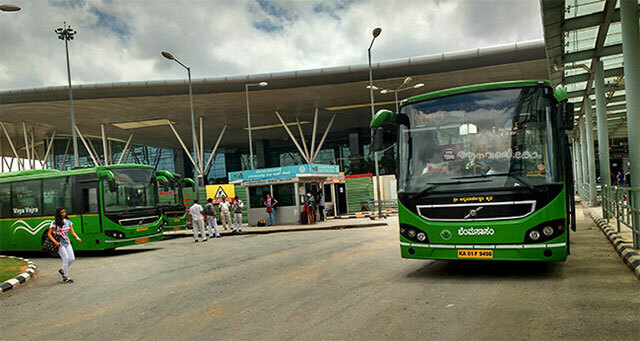 The aim is to increase the airport buses ridership and so the BMTC, (Bangalore Metropolitan Transport Corporation), has initiates a web check-in kiosk on a test basis within the bus. Currently, buses running from Electronic City to the airport (KIAS-8) are installed with this facility as BMTC’s second pilot project. While, the first pilot project was undertaken on the buses plying to the airport from Majestic (Kempegowda Bus Station). Passengers can make use of this facility, print beforehand their boarding passes and head for security checks straight, skipping at airline counters the long queues. This will be beneficial to customers who have no check-in luggage and are travelling just with hand baggage. “The pilot round is going on. We are receiving good response. The previous pilot that had gone for 20 days showed good response. We will introduce this facility gradually in all the routes,” said Ramesh, BMTC Divisional Controller, to TNM. Our customers on an average spend an hour in traveling to the airport. So, if they use this facility, they can save time. In the meanwhile, our conductors are teaching customers to use this facility. This is applicable to people flying to different locations in India using five airlines namely, SpiceJet, Air Asia, GoAir, Jet Airways and IndiGo. Apart from the check-in services, BMTC is talking with the airport authorities to streamline the luggage handling facilities. “This is under discussion. We are having a discussion next week. This will be another add-on service that we wish to give our customers,” said Ramesh. The AC buses of BMTC saw ridership decline due to Ola and Uber cab services competition. However, BMTC slashed its ticket prices up to 37% at the year start and noticed a spike of 43% in next 15 days. Be the first to comment on "Web Check-in Kiosk in Bengalaru Airport Buses Helps Skipping Long Queues at Airline Counters"